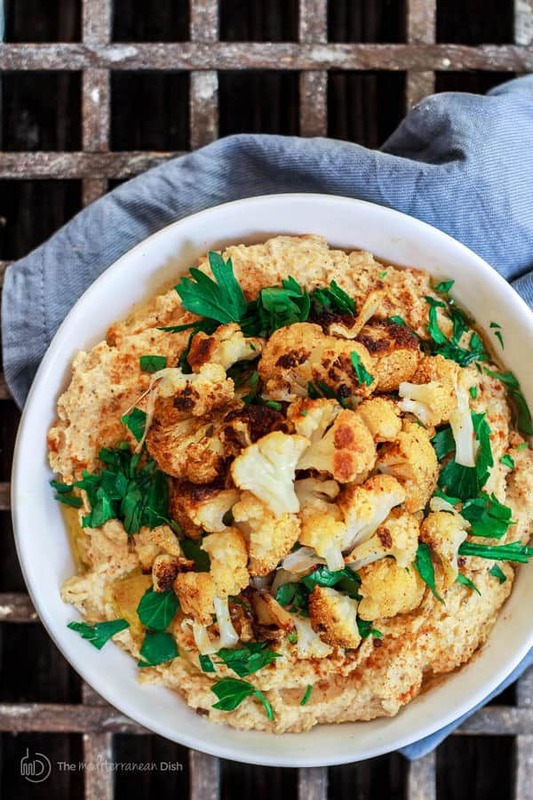 Roasted cauliflower and tahini come together in a delicious Middle Eastern-style spicy dip! A great wholesome appetizer; or serve it warm as a side dish of mashed roasted cauliflower! Be sure to scroll down for the step-by-step photo tutorial. The best cauliflower head to buy–my dad taught me– is one without bruises. It must be heavy for its size, and has a nice cream color all around. Farmer’s market excursions with my dad typically included a quick lesson or two on selecting quality produce. For that, I’m grateful. Dad and I typically filled up our grocery basket with fresh herbs and our frequently consumed produce like tomatoes, eggplant, zucchini, and cauliflower. Come to think of it, my grocery basket hasn’t changed much since. On my last shopping trip, for example, I bought, not one but two cauliflower heads. And as I made the purchase, my mind was focused on roasted cauliflower. By the time I arrived home, the idea had developed into this recipe for roasted cauliflower tahini dip. 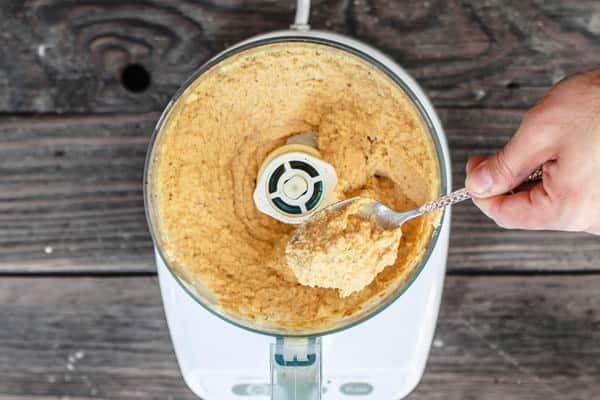 Tahini is basically a paste made from ground sesame seeds; mild but rich which is what makes it a great candidate for dips like hummus. You have seen tahini sauce here on the blog also as an accompaniment to grilled chicken kabobs or my previous kofta recipe. Today’s recipe capitalizes on the creamy qualities of the cauliflower and tahini both. 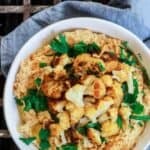 The flavoring in this roasted cauliflower tahini dip comes from the bitter, peppery turmeric (which has many health benefits, by the way); deep smoked paprika; spicy cayenne and other Middle Eastern spices. But honestly, the whole point of the dish remains in roasting the cauliflower until tender and caramelized until that subtle sweetness comes through. 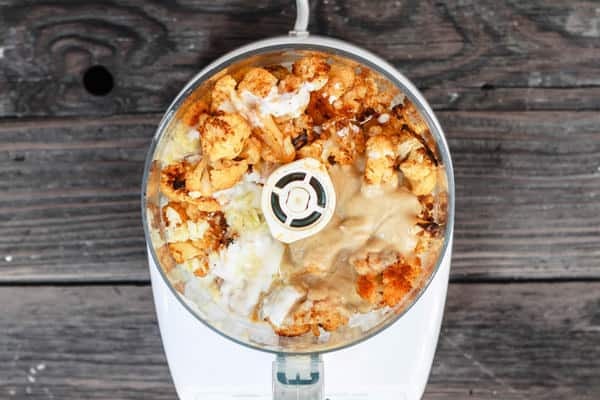 Here is the recipe for roasted cauliflower tahini dip, be sure to scroll down for the step-by-step tutorial and similar appetizers! 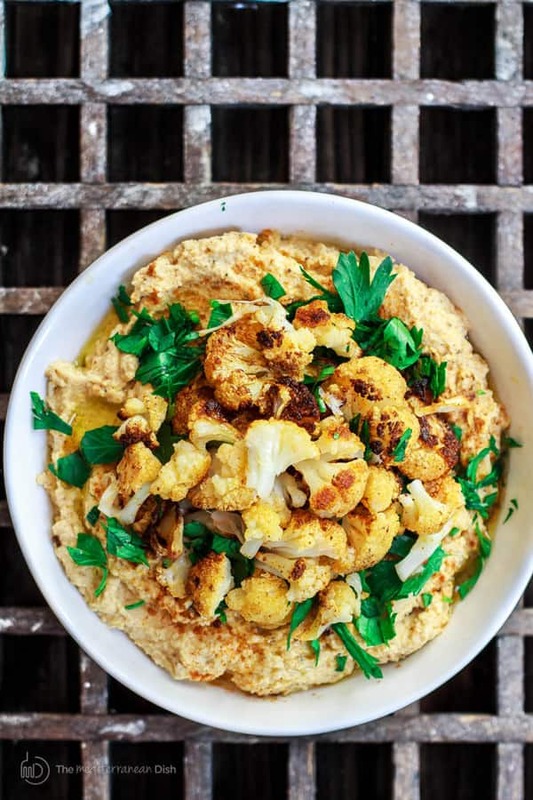 A Middle Eastern-style spicy dip with roasted cauliflower and tahini. Packs flavor from garlic, lime juice and warm spices. Place the cauliflower florets on a large, lightly oiled baking sheet. In a small bowl, mix the spices. Toss the cauliflower with the spices and the olive oil until well-coated. If needed, add more olive oil, and toss again. Be sure to spread the cauliflower florets on the baking sheet in one layer. Roast in the 450 degrees F heated oven for 45 minutes; turn the florets over midway through roasting. When the cauliflower is tender and nicely browned in some parts, remove from the oven and let cool briefly. Place about 2/3 of the roasted cauliflower in the bowl of a food processor (you will use the rest later). Add the garlic, yogurt, lime juice, tahini paste and a pinch more seasoned salt. Blend until smooth. Test and season accordingly. If the dip is too thick, add very little water and blend again until you achieve desired consistency. 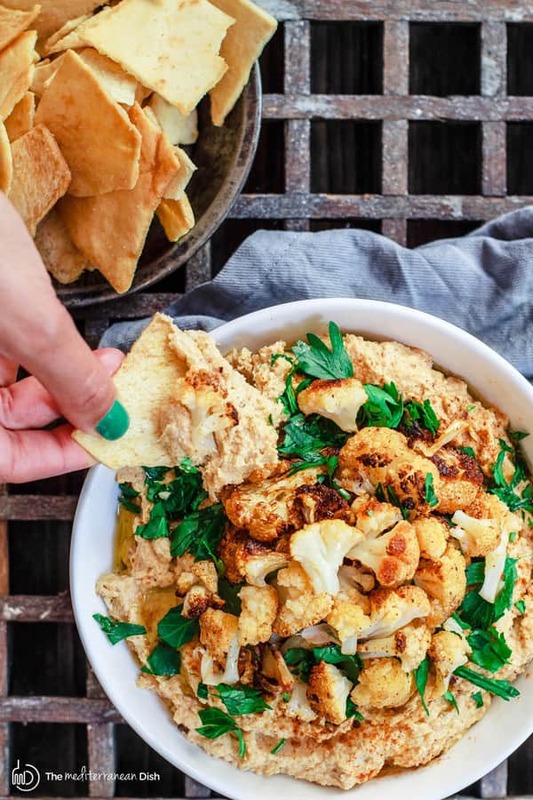 Transfer the roasted cauliflower tahini dip into a serving bowl and drizzle a generous amount of olive oil. Top with the remaining roasted cauliflower and the fresh parsley. Cover and refrigerate the dip. Remove from the fridge about 10 minutes or so before serving. Serve with pita bread or chips. 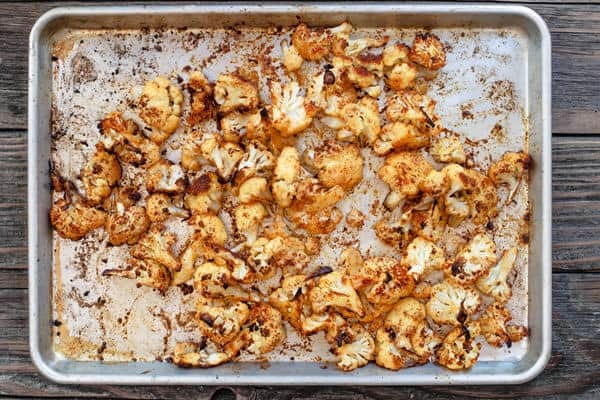 Place the cauliflower florets on a large, lightly oiled baking sheet. In a small bowl, mix the spices. Toss the cauliflower with the spices and the olive oil until well-coated. If needed, add more olive oil, and toss again. Be sure to spread the cauliflower on the baking sheet in one layer. Roast in the 450 degrees F heated oven for 45 minutes; turn the florets over midway through roasting. When the cauliflower is tender and nicely browned in some parts, remove from the from the oven and let cool briefly. Place about 2/3 of the roasted cauliflower in the bowl of a food processor (you will use the rest later). Add the garlic, yogurt, lime juice, tahini paste and a pinch more seasoned salt. Blend until smooth. Transfer the roasted cauliflower tahini dip into a serving bowl and drizzle a generous amount of olive oil on top. Add with the remaining roasted cauliflower and the fresh parsley. I had a friend coming over for dinner so I made this dip to have with drinks. It’s truly scrummy. Awesome, Margi! Thanks so much! What a great recipe! I wanted to make it vegan,so I substituted the yogurt with lemon juice and it turned out DELICIOUS! I love this dip and would like to make it for a New Year’s Eve party. How far in advance can it be prepared? Hi Julie, you can make this the evening before. Store in a very tight-lid container in the fridge. So wonderful to hear this, Dawn! thank you for kindly sharing with me. Hope you find more recipes to try.